Wolfgang Capito, reformer of Strasbourg, b. 1478 at Hagenau, son of the respected councilor Johann Köpfel, studied at the universities of Ingolstadt, Freiburg, and Basel, first medicine, then jurisprudence, and later theology, and in 1512 was made cathedral preacher at Bruchsal on the recommendation of Philip von Rosenberg, Bishop of Speyer. Here he became a friend of Melanchthon. In 1515 he was made cathedral preacher at Basel, in 1519 chaplain to the Archbishop of Mainz, and in 1523 provost at the church of St. Thomas in Strasbourg, where he turned his energy to the Reformation. With Caspar Hedio, Matthias Zell, and especially Martin Bucer he worked with unflagging zeal for the Protestant cause until his death by the plague in 1541. Of all the reformers Capito was nearest the Anabaptists. He was the close friend of several of them. In general he judged them favorably, and "asserts that he regarded most of them as God's elect, gifted with the fear of the Lord, and some also as steadfast confessors of the glory of God, yea, loved them as dear brethren." For a time it seemed that he might step completely over to their side and become their mighty leader; but this did not happen. We shall present first his theological position as revealed principally in his commentary on Hosea, and then his relation to the Anabaptists separately. Capito opposed infant baptism. To him (as to Denck) the sacraments are only outward ceremonies, symbolic acts; as such they did not belong to Christ's kingdom; for this was within us and was nothing but righteousness, peace, and joy in the Holy Ghost. Just as little may the sacraments be thought of as a means of gathering and preserving the church. The generating, ruling, and preserving power of the church was rather the Spirit, who as a gift of God simply came down from above; the sacraments were merely symbols of the life of the Spirit already present in the believer. Baptism was actually a confession of the faith dawning upon us and a declaration of the determination to kill the flesh and follow the leading of the Spirit. From this the inadmissibility of infant baptism followed. In this conception of baptism and the ordinances Capito touched the Anabaptist position most closely. To be sure, he repudiated rebaptism. The wish of the Anabaptists in this respect he called a clinging to the vain elements of the world. "Those are farthest from the kingdom of God, who today are working with all their might to have baptism repeated after hearing the Word" (Hosea, 33 B and 34 A). He favored accepting infant baptism as a practical measure (Capito, Kinderbericht, 1529, 30 A; Hulshof, 71, and Usteri, 463ft). The Scriptures were to Capito the Word of God as the work of the Holy Spirit who has spoken through men; but the outer Word was only a dead letter, which one must guard against idolizing. It was only a witness of the truth, not the actual and highest source of the understanding of the things of God. This source was God Himself and His Spirit. We had the true teacher within us, the Spirit of truth, who instructed in the stillness of the heart. Through Him we had the law of God written in our hearts, which was the only way to know Him. True faith then was not based on the word of Scripture, but on the inner, living word of God, that light of the soul which illuminated us.—The object of the outer Word in Scripture and preaching was to remind us of God's works and thereby awaken our spirit and implant faith in us. In addition we had in the Scriptures a touchstone for all that sought to be regarded as Christian truth and divine revelation, not only for every false doctrine, but also for the inspirations we received within ourselves; for great caution was needed lest we accepted human inventions instead of the divine, or considered that to be the will of the Lord which only our ungodly flesh substituted for it. It was therefore necessary to compare with the Scriptures all that particularly moved and pleased us; they were the most dependable guide, by which we put in order our wrong emotions; that is, by which we were to prove their solution only in the spirit. It is clear that Capito expressed ideas that recurred in the writings of Denck and other Anabaptists in his position on the Scriptures, when he contrasted the dead letter with the Spirit and subordinated the former to the latter, distinguishing between the outer word and a living, inner word, when he did not rank the Bible as the supreme source of revelation but as a witness, since the knowledge of God had its basis in the spirit and made itself known in all the works of God, when he often spoke of the anointing perceived within the heart. Note also his statements about the apparent contradictions in the Bible, which found their solution only in the spirit. Capito's chiliasm was also closely allied to the Anabaptist concept. He distinguished three periods in the era of the exalted Christ: (1) the apostolic age, (2) the reign of Antichrist, and (3) the age of Christ's absolute reign on earth after the fall of the man of sin. The third period was divided into beginning, progress, and fulfillment. The beginning was the Reformation period; the impending severe persecutions of its adherents Capito took for sure proof that salvation had come near. Pure and simple preaching of the Gospel would bring about the victory of Christ, who would immediately, as King of Glory, take upon Himself the power over all things. In addition the heathen throngs would be converted and all Israel would be saved. This perfect reign of Christ would be followed by eternal glory and the resurrection of all the saints. At first Capito interpreted the millennium as a spiritual reign of the perfect knowledge of God and brotherly love. All outward things, including baptism and communion, would be done away; Christ would be all in all through His spirit. But this spiritual glory of the perfected kingdom of God would be clearly reflected in human relationships as well; it would be a universal reign of peace. No race would lift the sword again against another. There would be no need of temporal kings. The Jews would occupy a favored position; the prophets had foretold this. Denck made similar assertions. Yet in all these points Capito was materially influenced by Borrhaus; this is especially the case in his position on the doctrine of election. Capito held that there were two classes of men, elect and rejected, or vessels of mercy whom God had determined from eternity to eternity for blessedness, and vessels of wrath whom He had prepared for destruction. The only basis for this contrast was the free, eternal, and unchangeable decree of God. The former had implanted within them from birth a seed of piety, a religious and moral inclination to the good, whereas the others carried within them the seed of vice (Heberle, 297-306). He denied all freedom of the will: "Freedom of the will is the worst plague of true religion." Even more definitely Capito attacked the Anabaptists when he spoke of the separation of believers from unbelievers; he would grant only spiritual separation. The individual must not fraternize with their teachings or with obvious sinners; but this avoidance should never become a public matter or lead to excommunication. Furthermore he attacked the Anabaptist rejection of warfare and demanded obedience to the government when it called its subjects to defend the nation. Christ's teaching that we shall resist evil was meant only for the individual Christian. It was the duty of the government to defend the helpless, and the duty of the individual to support the government. He vigorously attacked the repudiation of the oath, calling the oath an act of worship. Christ did not repeal the law or make a law, but re-established divine law in its original purity; by their refusal to render the oath the Anabaptists were trying to overthrow the basis of morality under the pretext of piety. To refuse the oath offended the public peace, the legal order instituted by the Lord, and, most important of all, brotherly love. Finally Capito condemned the Anabaptist position on rejection of the preaching office and the practice of lay preaching. All this made it quite clear that, after all, Capito was far removed from Anabaptism. When Capito had been in Strasbourg scarcely a year he came in contact with the beginnings of the Anabaptist movement. Late in 1524 Karlstadt had come to Strasbourg for a short time, and his writings advocating the rejection of infant baptism had been distributed in the city. Thus the attention of the Strasbourg clergy was directed to this important question. Capito wrote to Zwingli on 31 December 1524, that he would give the question of infant baptism more thought; he feared that many would be misled by ruinous doctrines in writings he had not yet seen. He made a similar statement in a letter to Bugenhagen on 8 October 1525, reporting also, "A preacher from Waldshut appeared here, who proclaimed the need of rebaptism. Persons who were not baptized anew were condemned, as though salvation were bound to the element of water." He apparently did not come in personal contact with Balthasar Hubmaier, the preacher referred to, who spent a short time in Strasbourg in 1525, but he felt the influence of this energetic Anabaptist leader. On 6 February 1526 he lamented in a letter to Zwingli that many in the city were no longer having their children baptized. Soon after this, Capito made his first personal acquaintance with an Anabaptist. It was Wilhelm Reublin, who came to Strasbourg in March 1526, and with whom he disputed in his home on the matter of baptism. When Reublin then circulated the report (letter of Capito to Zwingli, 6 April 1526) that the clergy had espoused Anabaptism, and did not venture to advocate it only out of fear of temporal force, he was three times challenged to a disputation on baptism. He declined because he did not think it necessary; nor did he consent to a public disputation, but left the city, perhaps on the advice of Matthäus Zell, who knew nothing about the plan for a public disputation. On the whole Reublin seems to have made a favorable impression on Capito. Capito called him "a pious man of upright appearance" (Hulshof, 10). Capito had unpleasant experiences with the Anabaptist Hans Wolf of Benfeld, who was obviously a fanatic, and preached that the world would be destroyed in seven years at the stroke of twelve on Ascension Day. Capito took him into his house several days to change his views, but Wolf became all the bolder in attacking the clergy and was therefore sent back to Benfeld on 30 July 1526 on a threat of death if he again annoyed the clergy of Strasbourg (letters to Zwingli 16 May and 11 June 1526; see also Hulshof's correction of Gerbert's account 14-18). Now Capito hoped that Anabaptism had disappeared from the city (letter to Zwingli 30 September 1526), but it was a false hope. A few weeks later the three Anabaptist leaders, Haetzer, Denck, and Sattler, came to Strasbourg. Haetzer apparently came first. Capito received him in his home. They had perhaps been friends as students at Freiburg; and Capito respected Haetzer's learning. Haetzer at first avoided all contact with the Anabaptists, working in seclusion on his translation of Isaiah, perhaps aided by Capito, until he received better help from Hans Denck. Haetzer was, however, soon expelled from the city (the elaboration of the affair by Gerbert, 45 and following, is based on a false evaluation of Haetzer), and it was his opinion that Capito had shown him the door to avoid embarrassment. Nor was Capito able to be friends with Hans Denck. Before Denck's appearance he had considered the Anabaptists "perverted, eccentric persons, puffed up with vanities, but otherwise quite harmless" (letter of 11 June 1526, to Zwingli), but after Denck's brief influence he saw in them a perilous threat to the evangelical cause in the city (letter to Zwingli, 26 December 1526). Before he had become personally acquainted with him he agreed with the general unfavorable opinion of him (letter to Zwingli, 10 December 1526), calling him a sly and variable man, who brashly and insolently slandered all the preachers everywhere (which Keller repeats erroneously on p. 156); but after listening to Denck's disputation with Bucer, Capito praised Denck's morally clean life, the dexterity of his mind, and his attractive personality (letter of 26 December 1526; Hulshof, 26). But Capito was particularly offended by Denck's doctrine of the atonement. In the letter of 26 December he said, "Denck has most artfully presented the contents of his book (Vom Gesetz Gottes); once he affirmed, and then he denied; then he again yielded and with remarkable skill he sought all sorts of loopholes. Meanwhile we were satisfied to hear his admission that he agreed with us on the main points, whereas he is actually far removed from us." In the letter of 10 December he said, "I do not understand the spirit of such people. I only know that they are not of God, they, who take away from us the center of Christianity, and do not even leave us our trust in Christ's suffering." In Denck he saw a "complete repudiation of the doctrine of faith" and expressed his satisfaction in seeing him banished from the city. But toward Michaei Sattler Capito developed a warm friendliness, and also received him into his home. Sattler's genuine piety and Biblicism won his complete sympathy. When the Anabaptists were imprisoned after Denck's expulsion, Sattler was permitted to remain free at the instance of Bucer and Capito. But he was too honest to endure freedom while his brethren suffered imprisonment. "He could not stay without great blasphemy," he said in his beautiful letter of farewell to the reformers (see Bucer) and left the city. He requested a disputation with Bucer and Capito before leaving, in order to prove his faith from the Scriptures. His request was granted and the disputation was conducted in a friendly spirit with a brotherly exchange of ideas. Then he parted from them. Several months later he suffered a most terrible martyr's death in Rottenburg a.N. Capito was shocked by the news of Sattler's execution. He wrote a long letter to the council of Horb, where several of Sattler's fellow believers still lay in prison, warmly commending them. "Blasphemers may of course be punished; but Michael Sattler and his adherents could not be suspected of this; for they are not blasphemers, as far as we know, unless one regards as blasphemy the fact that these poor people have resolved to avoid the luxury of playing, drinking, gluttony, adultery, warfare, killing, slander, and carnal lusts and to flee what is worldly and carnal" (Hulshof, 66). Also a letter of consolation, "To my dear brethren and sisters, who are now witnessing for Christ the Crucified in their bodies by imprisonment and suffering in Horb," is said by Heberle to have been written by Capito (Heberle, 309). The original is in the Basel church archives (Baum, 375, and Hulshof, 67). It is signed, "A faithful brother and partaker of your hope in the Lord, whose name is known to God." Of special interest is Hulshof's assertion (p. 62) that on the same day Capito composed his statement entitled "Whether the Anabaptists Endure Death Because of Piety or Fanaticism" (ms. in Basel Church Archives; Röhrich, 39). There is a document identical with it in Simmler's collection of letters in the Zürich state archives, entitled "Capitos Fürsprache für die Wiedertäufer, 31. Mai 1527." Hence Röhrich and others are in error in dating Capito's statement 1528. Together with the letter to Horb already mentioned, it is an extraordinarily beautiful proof of Capito's genuinely evangelical, tolerant mind, not found in the other reformers. After Denck's expulsion and Sattler's departure Capito hoped that his struggle with the Anabaptists was over (letter to Zwingli, 22 January 1527), but he was mistaken. He was to become much more intimately connected with them. Their resistance was, of course, broken. "The Anabaptists have not entirely ceased, but neither are they a threat," he wrote to Zwingli on 28 February 1527. "We must just pay more attention to the simple in the future." There was no trace (said he) of a revolt, for a rumor had spread that the exiling of Denck threatened to bring about a revolt in the city (Keller, 165). But Capito became more and more worried about the activity of the Anabaptists in Strasbourg. "They are increasing in great numbers," he wrote to Zwingli on 8 April 1527, "instructed in very poor articles of faith. One of our chief worries about them is that they will destroy respect for the Word. I would never have surmised what we are now experiencing. It is the severest trial of the Lord." On 7 July 1527 he reported to Zwingli, "The Anabaptists cause us great distress." In a letter to Zwingli of 7 November 1527 he complained still more bitterly about the growth of the Anabaptists: "Daily their number increases, and they keep introducing new ideas which have not the least connection with the glory of God. I regret that so many good people are enmeshed in the affair." In the meantime Capito's religious views had been approaching those of the Anabaptists, chiefly under the influence of Borrhaus. On 18 August 1527 Capito reported to Zwingli the debate held between Borrhaus and Denck in the presence of Haetzer in December 1526: "By his modest dignity Borrhaus won Denck so completely to his side that he agreed in all points; he also threw light on Denck's book on the freedom of the will by way of apostolic ideas, so that Denck solemnly assured him that everything was now completely arranged" (Gerbert, 34; Hulshof, 39; Keller, 159, who takes a different view of this passage in the letter). These statements show Capito's pronounced bias in favor of Borrhaus, whose influence on Capito continued to increase. In July 1527 he wrote the foreword to Borrhaus' book, De operibus dei, warmly recommending it. Bucer and Zwingli were astonished. Scarcely a year later (April 1528) Capito's commentary on Hosea was published, in which he presented the views already mentioned, which were in part very close to those of the Anabaptists. Alarmed, Bucer asked Zwingli and Oecolampadius for help in releasing Capito from this influence. This plan succeeded. Very cleverly Zwingli addressed a letter to both Capito and Bucer on 16 June 1528, which produced the effect desired; that is, Capito took a more reserved attitude toward Borrhaus and the Anabaptists. O. E. Strasser writes in Capitos Beziehungen zu Bern (Leipzig, 1928), 31 f.: "As a silent observer Capito must have attended the entire colloquy at Bern on 6 January 1528. The thing that filled him most in this entire period he probably shows us himself in his commentary on Hosea, at the place where he recalls the Bern disputation (in Hoseam 270b), by his mention of only the act of amnesty toward some Anabaptists. This incident seems to have moved him most, an incident that is not even mentioned in the official records. In this matter Capito grows warm. 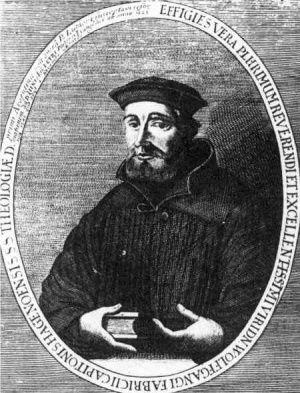 For getting restraint, he betrays, as he had already done by his characteristic participation in the debate when it concerned the Spirit, what occupied Capito during the Bern disputation which was to be of such great significance to the Swiss and South German Reformation; that is, it was the Anabaptist concept. Capito lived in Anabaptism at that time. . . ."
Of great significance to us is this passage from the letter of justification he wrote to Zwingli on 31 July 1528: "I make a clear distinction among the Anabaptists. There are among them principals and leaders, whom they themselves call 'Vorsteher'; all of these avoid me as the mouse does the cat; I cannot bear them; for all of them, as many as I have seen, are full of secret intrigues and craftiness. There are others who are distinguished by an admirable simplicity of spirit, who are injured by the error they cling to. If one deals gently with these and gives them time, they come toward our side. I do not reject these unless after long treatment I have found them obstinate. ..."
In two other letters Capito wrote in a similar vein. He wrote one on 13 September 1528, to Ambrosius Blaurer: "Among the Anabaptists I have found excellent souls, receptive to true piety, who can by your kindness be led back to the fold of Christ from which they have thoughtlessly strayed through ignorance and lack of understanding of Christ and His kingdom. In addition there are also many among them who are filled not only with errors but also with malevolent intentions, and plan agitation and revolt, and that by means of a re-establishment of the Mosaic law. . . ."
Of interest is Capito's correctly recognized and consistently maintained distinction between the quiet and the revolutionary Anabaptists. In the second letter, written to Musculus on 17 April 1530 (Hulshof, 72, 127; Baum dates it 1533, Gerbert probably correctly 1528), Capito objected to Bucer's violent procedure in dealing with the Anabaptists. He says: "I am in absolute agreement with your treating these poor people with pity and kindness herein; you have my complete and entire consent; for the harm they do is not serious. I am constantly shocked by the ruthless procedure of my brethren against them. . . .
"Bucer is urging a government command on infant baptism, which I at present do not wish to abolish. But I do not want to block him, only he must count me out; for I know very well that the supports produced for infant baptism have no convincing power." Here Capito once more urged the exercise of gentleness and consideration toward the Anabaptists and leaving the judgment to God. Capito's lenient attitude was carried out in his deeds. In the numerous examinations of Anabaptists during 1528 Capito took pains to change their opinions by kind encouragement. He made an especial attempt to gain their consent to giving the customary constitutional oath which was required every January. He reports his success in a letter to the bailiff Nikolaus Kniebiss (Röhrich, 42): "He presented their error to them; if they referred to Matthew 5 he pointed out that this passage was directed against the Pharisees who swore falsely. . . ."
He also treated Pilgram Marpeck benevolently. He had a conversation with him before he was imprisoned. "But it did not take effect." During his confinement Capito visited him and encouraged him. Not until Capito left the city for an extended journey was Marpeck expelled from the city. It can be assumed that Capito protected him. It must also be mentioned that Capito gave Caspar Schwenckfeld board and lodging in his home for two years, and that in the summer of 1531 he received Bernhard Rothmann and Michael Servetus as guests. Nothing shows more clearly than this his liberal attitude, even though these men were not yet as notorious as heretics as they were later. About 1533 Capito's attitude toward the Anabaptists underwent a definite change, and now he sided completely with Bucer. This came about as the result of an extended journey through Switzerland and South Germany from December 1531 to April 1532, made on the insistent urging of Bucer. One object was to relieve Capito of the melancholia that overtook him after a serious illness in 1529 and especially after the death of his wife (1531) and Zwingli; he also wished to divert Capito from his intention to marry the widow of Augustin Bader (see Capito's letters to Vadian, 18 September and 10 October 1531) in order to have him marry the widow of Oecolampadius, who had died on 21 November 1531. Both aims were accomplished. Capito returned a different man. The friendly reception he enjoyed everywhere, the success of his endeavors for unification, had won him completely for his church. In April 1532 he married the widow of Oecolampadius. From this time on his attitude, toward the Anabaptists and all who stood aloof from his church is changed. With great satisfaction Bucer wrote to Ambrosius Blaurer (11 October and 16 November 1532), "Capito is entirely one of us, had it only been always thus." In his letter to Musculus (23 November 1532) Bucer wrote, "At first Capito was too lenient, now he is determined and severe enough." Whereas he had formerly called Schwenckfeld his dear brother, he cannot now do enough to warn others of this sectarian (Gerbert, 189). He favored the application of sterner measures against Melchior Hoffman and his adherents. Capito's altered frame of mind was clearly set forth in a popular pamphlet, Eine wunderbare Geschichte und ernstliche Warnung Gottes, so auch an ein Wiedertäufer, genannt Claus Frey, zugetragen hat, . . . (1534) (see Röhrich, 80-99). He knew nothing good to say about the Anabaptists any more. Their piety and virtue were only outward show, of which he warned his people. He saw all mischief in separation from the church; he used the unfortunate aberrations of a man who was living in common law marriage to paint in the darkest colors how far astray separation led. Whereas he had previously praised the courage of martyred Anabaptists (especially in his Apologie, 1527), he now designated it as the work of the devil. "It is the manner of heretics, especially because they have no Scriptural foundation, to prove their deception with a defiant death (Röhrich, 94). The devil can also strengthen the heart out of desperation!" (Röhrich, 92). In conclusion he enumerated all the shameful deeds of the Anabaptists, how they were intent upon "slaying all priests, monks, princes, noblemen, citizens, and peasants, be they Catholic, Lutheran, or Zwinglian. Innumerable terrible plans of this kind are concealed under the sour-faced looks and highly spiritual conversation.— May God preserve all the goodhearted from going astray and from self-directed planning, especially in matters of faith, so that they may continue to come to the true knowledge in and through the church of Christ." And yet this very man had once given the excellent and true testimony to the Anabaptist movement: "Meanwhile a great benefit flows from their rise to all the churches—the people are more careful, the leaders are more alert, and all offices are better provided for. Where Christ has not yet been preached, there one is of course safe from such a plague; but the people suffer from a much more serious evil, namely, a lack of God's Word." However near Capito was in many respects to the Anabaptist position, he was still far from being one. For a time, it is certain, he surpassed all his contemporaries in correct and clear understanding, generous tolerance, and benevolent judgment of the Anabaptists. (Concerning Capito's relation to Anabaptism see also his letter to Michael Keller of 17 May 1528 in Archiv für Reformationgeschichte, 1937, 157-159. Capito's inner and outer turning away from the Anabaptists toward the Strasburg church system is described by Fr. Thudichun in Die Deutsche Reformation 517-1537 II, Leipzig, 1909, 619-620.). Baum, Johann Wilhelm. Capito und Butzer: Straßburgs Reformatoren. Nach ihrem handschriftl. Briefschatze, ihren gedruckten Schriften u. anderen gleichzeitigen Quellen. Elberfeld: Friderichs 1860. Gerbert, Camill. Geschichte der Straßburger Sectenbewegung zur Zeit der Reformation 1524-1534. Strasbourg: Heitz, 1889. Heberle, J. "Capitos Verhältnis zum Anabaptismus. "Zeitschrift für historische Theologie (1857): 285 ff. Hege, Christian and Christian Neff. Mennonitisches Lexikon, 4 vols. Frankfurt & Weierhof: Hege; Karlsruhe: Schneider, 1913-1967: v. I, 326-333. Herzog, J. J. and Albert Hauck, Realencyclopedie für Protestantische Theologie and Kirche, 24 vols. 3rd ed. Leipzig: J. H. Hinrichs, 1896-1913: v. III, 715 ff. Hulshof, Abraham. Geschiedenis van de doopsgezinden te Straatsburg van 1525 tot 1557. Amsterdam: Clausen, 1905. Keller, Ludwig. Ein Apostel der Wiedertäufer. Leipzig, 1882: 148 ff. Röhrich, T. W. "Zur Geschichte der Strassburger Wiedertäufer 1527-1543." Zeitschrift für historische Theologie (1860). Usteri, J. Die Stellung der Strassburger Reformatoren Butzer und Capito zur Tauffrage. 1884: 456 ff. Neff, Christian. "Capito, Wolfgang (1478-1541)." Global Anabaptist Mennonite Encyclopedia Online. 1953. Web. 18 Apr 2019. http://gameo.org/index.php?title=Capito,_Wolfgang_(1478-1541)&oldid=144922. Neff, Christian. (1953). Capito, Wolfgang (1478-1541). Global Anabaptist Mennonite Encyclopedia Online. Retrieved 18 April 2019, from http://gameo.org/index.php?title=Capito,_Wolfgang_(1478-1541)&oldid=144922. Adapted by permission of Herald Press, Harrisonburg, Virginia, from Mennonite Encyclopedia, Vol. 1, pp. 512-516. All rights reserved. This page was last modified on 16 January 2017, at 00:03.